This is the beautiful parterre garden, which adjoins the back of the barn and conservatory. 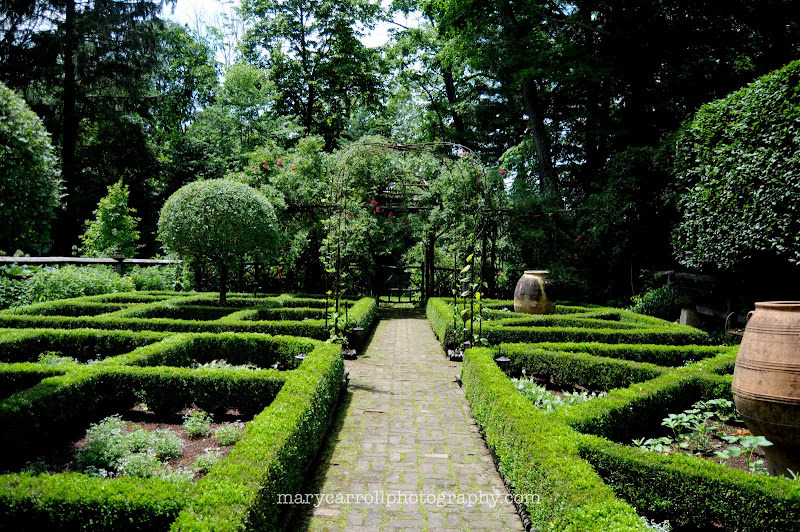 According to Miss Williams' book, An Affair with a House, the parterre garden started out as a potager, modeled on one by famed garden writer Rosemary Verey which was, in turn, taken from the historic French style. 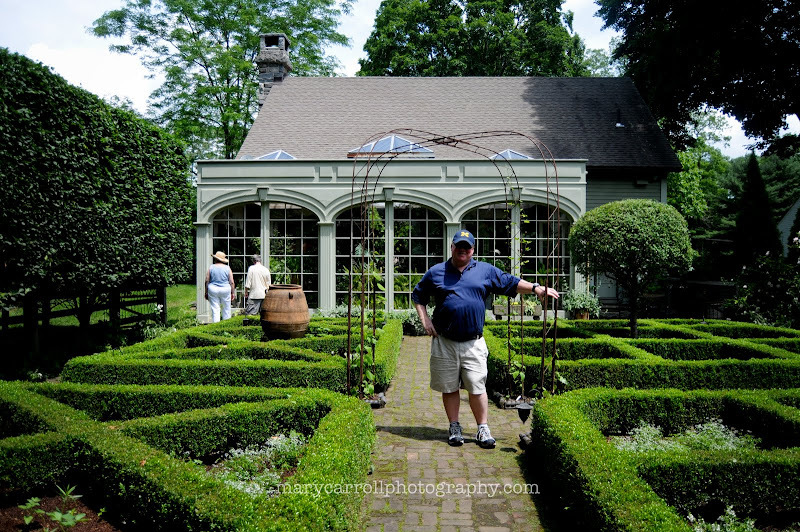 But as the barn was renovated, the vegetables were moved elsewhere and the garden became more of a formal knot garden. In spring it is filled with bulbs, which are pulled and replaced with colorful annuals come summer. 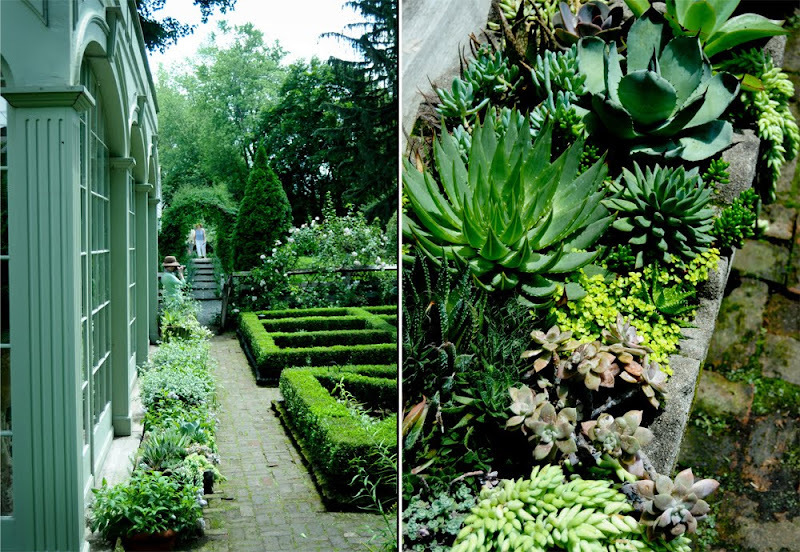 In the first photos, you can see the side of the conservatory with a row of stone troughs filled with succulents. 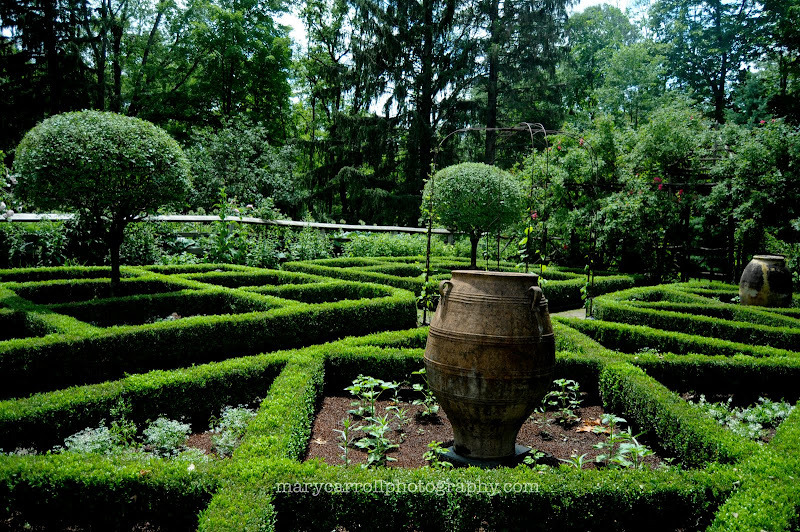 The second set of photos show the criss-crossing lines of the boxwood parterres, with a large Italian oil jar in the center. Also shown are a rustic wooden pergola which is covered with climbing roses, and several standard dwarf Korean lilac trees. In a garden with such strong horizontal lines, some vertical accents are key. As you can see, there is also a metal pergola in the center of the garden. The final photo shows the conservatory. I hope you are enjoying this extended tour of Bunny Williams' garden. I still have a few more photos to share, if you can believe it. What a lot of blog fodder I've gotten from this amazing visit! I love these garden posts. Having just planted more box plants than I could count I am inspired by seeing such a gorgeous and mature garden. There's hope for mine! Mary, what a lovely garden. I like the criss cross boxwoods and the large jar is pretty. Wonderful photos and mosaic. Have a great week! Oh to have a garden like that (and a gardener to go with it ;). Beautiful, Mary! Have a wonderful week! It's a fabulous garden. A garden of my dreams! I'm enjoying all the photos. Rosemary Verey? What a lovely name! What beautiful green!! It must have been amazing to see in person, your photos are wonderful! Gorgeous gardens, they are stunning. You captured them beautifully, Mary! I love the patterns of the box hedges! What a remarkable place! There's a beautiful historic home near where I live. Whenever I look at your Monday posts I think I should go and take photos of the garden, which is open to the public. Have a great week, Mary! This mature garden is just breathtaking. This is how I would love for my back to look like. Thanks for taking us on tour again of Bunny's gardens. It is a beautiful garden, but i can't imagine the labor requirements it has to maintain all those hedges plus the changing of the plants due to the seasons, as you described. Thanks for hosting Mosaic Monday, this is my first time to link in. This garden is full of wonderful design ideas that can be achieved even in a small yard. I love the stone troughs planted with succulents. This is my kind of garden... but of course it is... it belongs to Bunny W! Her style makes me swoon! Beautiful garden! Have a wonderful week. Fabulous! What a beautiful garden and I love the large clay pots. Mary, This place is so beautiful, and so full of wonderful and inspirational ideas. I could never tire of looking at your pictures...so happy that you have been sharing them! I just did a post about my own gardens. My husband should be thankful he doesn't have to take care of Bunny's! LOL! Look at all that Boxwood! Wow! I have enjoyed the weekly visits to the garden. A gorgeous garden. 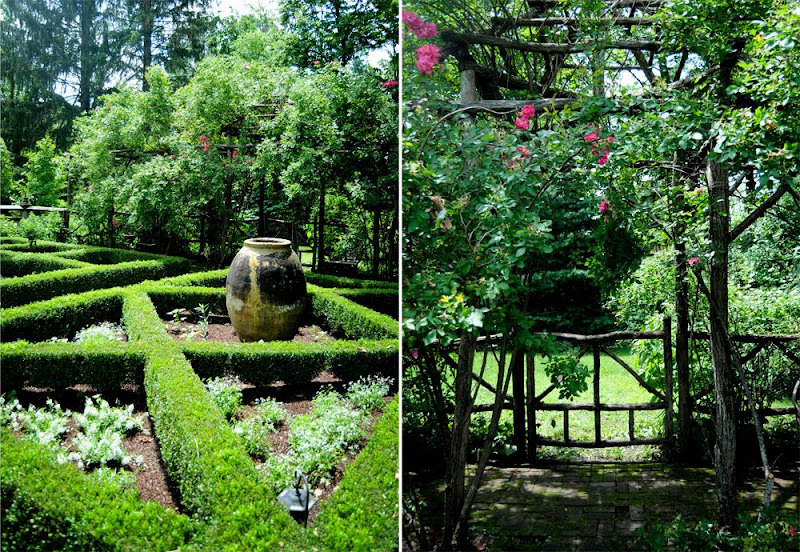 These are the most beautiful photos of the most beautiful garden imaginable. I have only seen one, in Austin Texas to even come near it. Would love to see this. Thanks (again) for this wonderful garden-mosaic! This place is just amazing! Mary, simply stunning garden, as only Bunny could envision. Thank you so much for sharing! All I can say is gorgeous, gorgeous, gorgeous! What a highlight of the week it is to stroll through these beautiful gardens with you, Mary. Many thanks for taking us along with you, and of course, for hosting Mosaic Monday. What a beautyful garden it is. Thank you for sharing Mary and thank you for hosting this weekly meme. I can understand why you are 'over the moon' over Bunny Williams garden. Your photos from the garden are just marvelous, you have caught the garden's soul. Have enjoyed them very much. You are such a fantastic photosgrapher, I think you can sell the photos to some garden/home magazine! I visited this garden a number of years ago with the Hortus Club when the conservatory was under construction. The results are so much more formal --befitting the conservatory's design, and fabulous. No surprise...this is Bunny Williams after all. Thank you for a beautiful post. 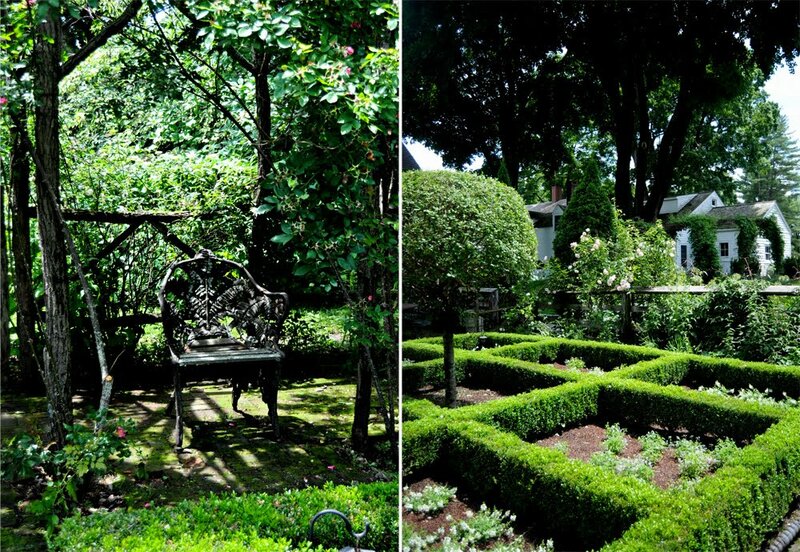 Bunny Williams' garden looks so tranquil with all the green and shady spots. I can imagine myself contemplating many things while sitting quietly on a shaded bench. Or maybe not thinking at all...just being. I am in awe! So beautiful. Beautiful blog fodder you have there! LOL Show us more, please. Oh wow . . . what a garden. I want to live IN the conservatory. Oh, bravo! What an absolutely breathtaking garden, Mary! Nicely done - perfectly presented. Now that is a garden worth waiting for!! Sorry I haven't been by in awhile...but I am glad I am back! I can't decide which part of her garden I like the most! Your photos are wonderful! This garden is gorgeous, and I'll have to go back and get caught up on your other posts. What a great place to photograph - and drool. My poor little garden has been neglected this summer and now I'm feeling even more sorry for it! Hello Mary - I look forward to seeing all the lovely gardens you share with us on your blog. You are lucky to be able to see so many beautiful serene places. thanks for welcoming me back! Bunny's garden is stunning, of course. Love the boxwood and the succulent bed. Garden perfection and not a weed in sight. I'm wondering just how many gardeners it takes to maintain it.